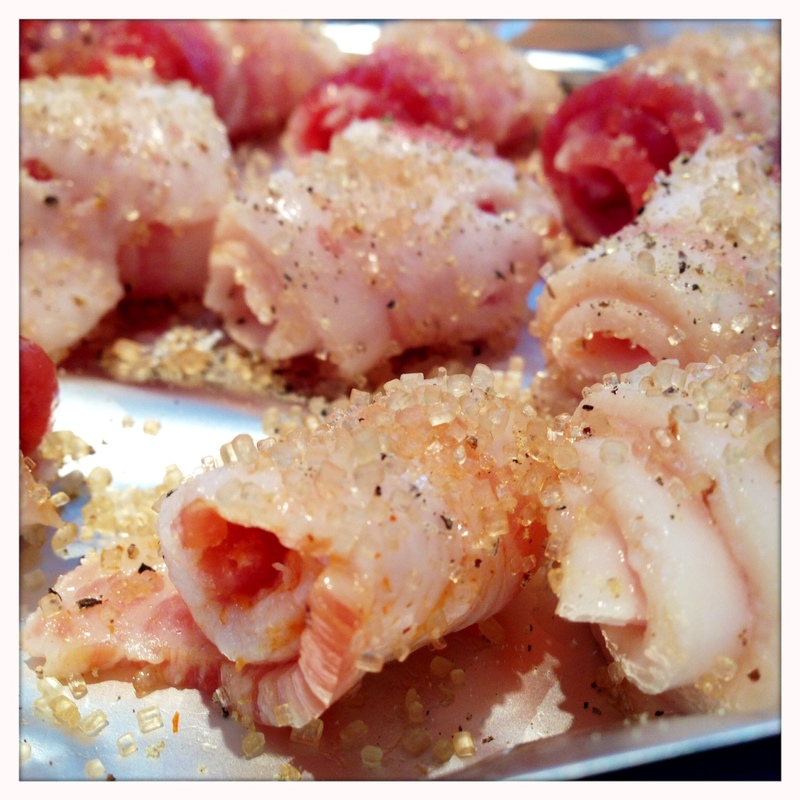 In this post, I will be covering two of my new favorite appetizers, both made with bacon. 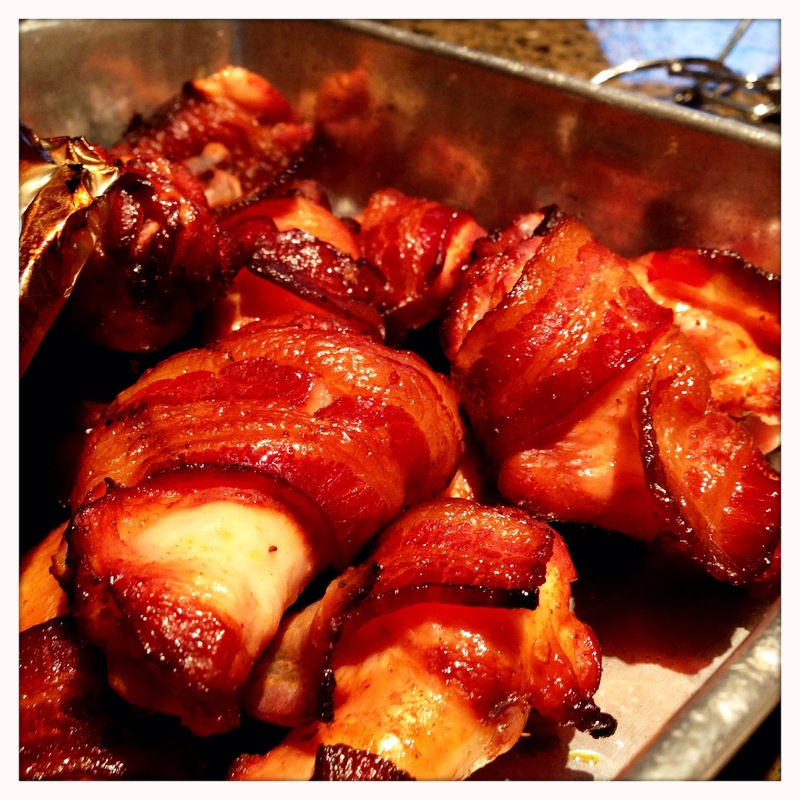 The bacon wrapped wings have a sweet and mildly spicy flavor (which can easily be adjusted to personal tastes), and the bacon candy is a perfect way to get on board with the current culinary trend of blending sweet and salty flavors! I made these both for the first time for a BBQ not too long ago, and they were excellent. The main course for the meal was pulled pork, and these all went onto the smoker while the pork shoulder was resting. They made for a great snack before dinner was served. If using a smoker, charcoal grill or gas grill, set up an indirect fire and target a cooking temperature between 275 and 300 degrees. If doing these indoors, I would set the oven to 300, and monitor them as they cook. While the fire is getting hot, you will need to separate the wings into the “wingies” and “drummies” if you purchased your wings whole. I have used both kitchen shears and a sharp knife for this. I recommend a knife because I think you have better control that way. I also recommend finding yourself one great utility knife that you can use for a variety of purposes rather than several mediocre knives. For me, that knife is a Wusthof Classic santoku, which I use for everything from delicate vegetables to large cuts of meat. Lay your wing out flat on a cutting board, and trim the tip off first. Find the joint where the tip meets the meatier wingie portion. Dislocate the joint by hyperextending the joint. When you hear/feel the joint pop out of place, you can slide your knife through the space between the bones and separate the wing tip easily. Discard the tip (or save to make a stock if you prefer). Next, separate the wingie and the drummie using the same technique. Bend the joint until it separates, and then slide your knife between the bones to separate. It takes a little practice to get through the joints without slicing into the bones, but once you get it down, you’ll be able to cleanly dismantle chicken wings like a pro. Toss the wings in a bowl and coat with Tiger Sauce. This is optional, but I really like the combination of spicy and sweet with this sauce. If you use it sparingly, it will still be plenty mild even for young eaters, and it adds a nice flavor to the wings. You can kick it up with a hotter sauce or tone it down with a sweet BBQ sauce if you prefer. 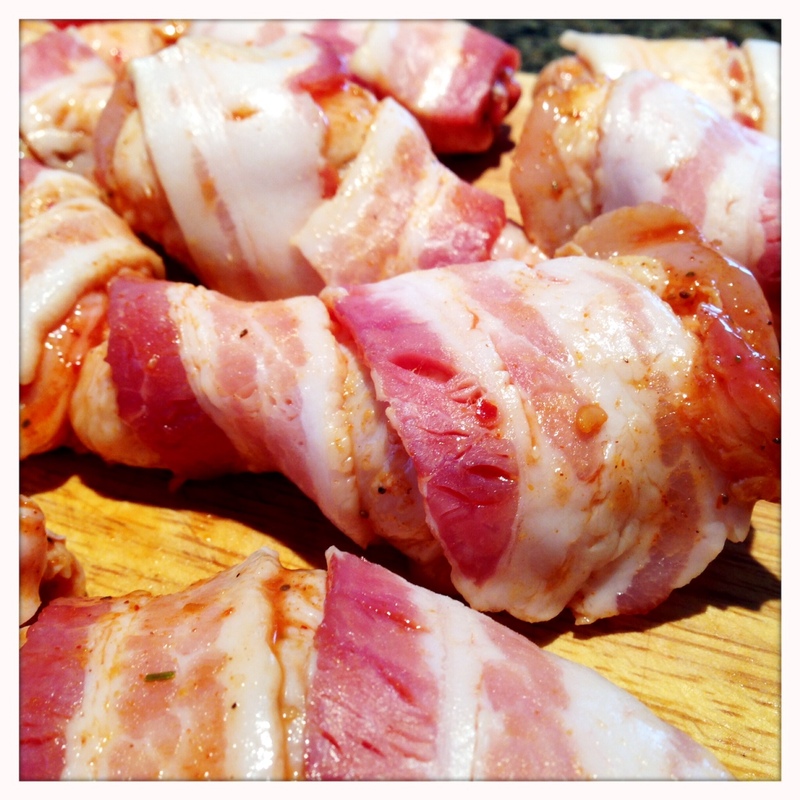 Next, dust the wings with a little Old Bay seasoning, and wrap in just enough bacon to cover the wing in one layer. The “bacon candy” came about by accident. 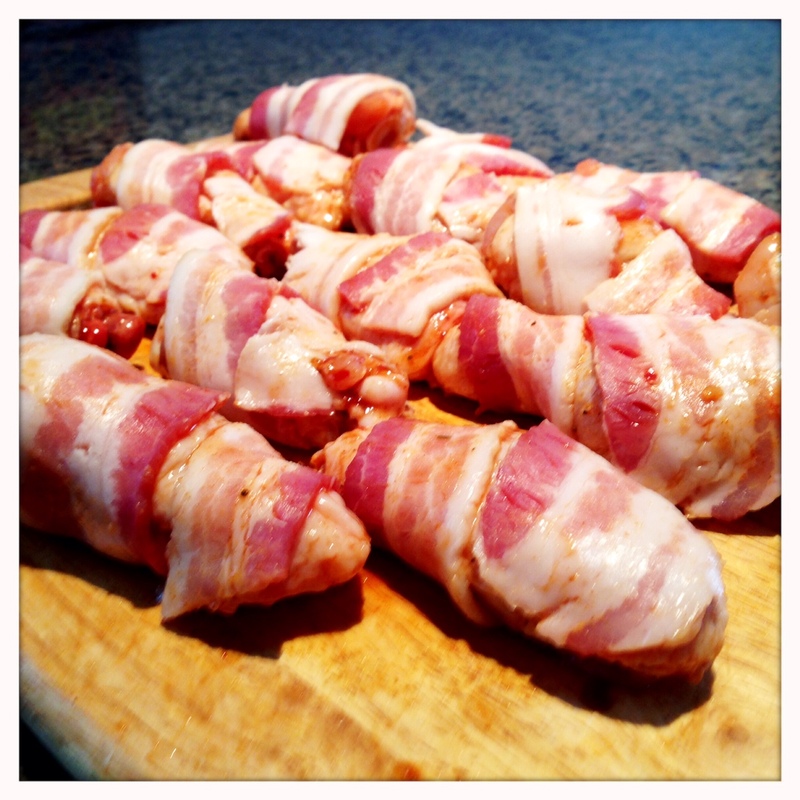 When making the wings, I had several slices of bacon left over. There was obviously cross contamination from touching the raw chicken wings and reaching into the package of bacon, so I knew I couldn’t save it for later. I considered just frying it up in a pan and saving it for sandwiches, but I decided to try something new instead. 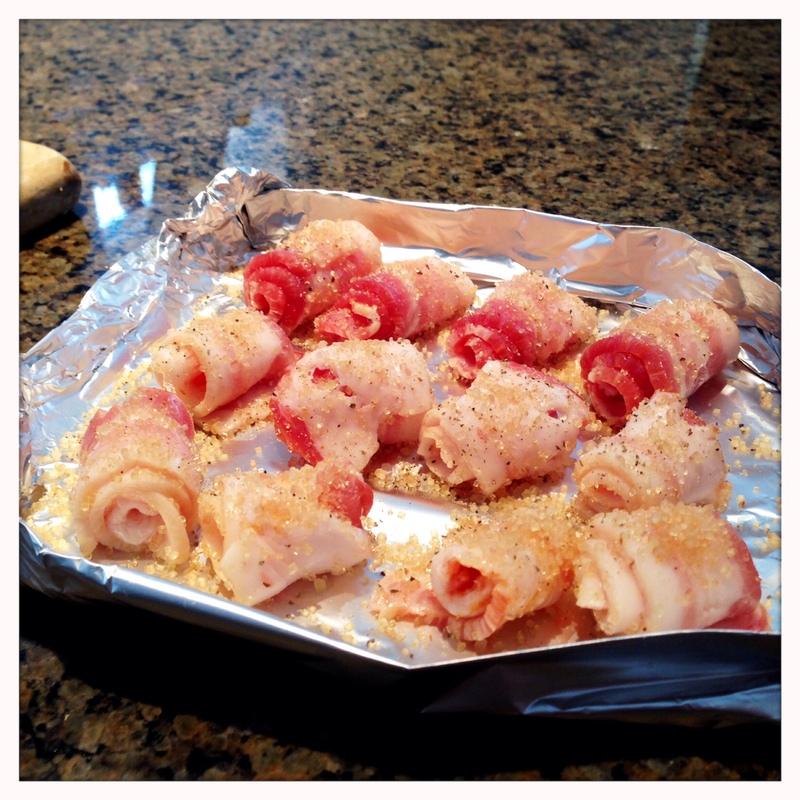 I cut each slice into thirds, and rolled the small pieces of bacon into small rolls. I cut each roll in half and placed them onto a small makeshift cooking sheet made out of foil. Each piece was liberally covered with turbinado sugar and fresh ground black pepper. Everything was then taken outside to the smoker to cook. 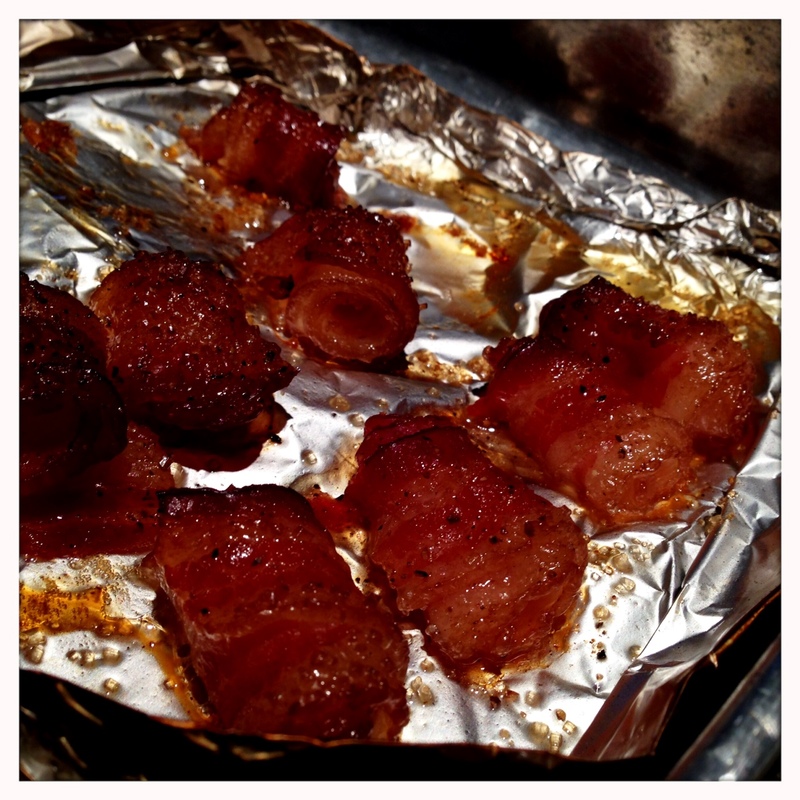 I placed the bacon candy on the foil sheet in the center and arranged the wings in a circle around them. 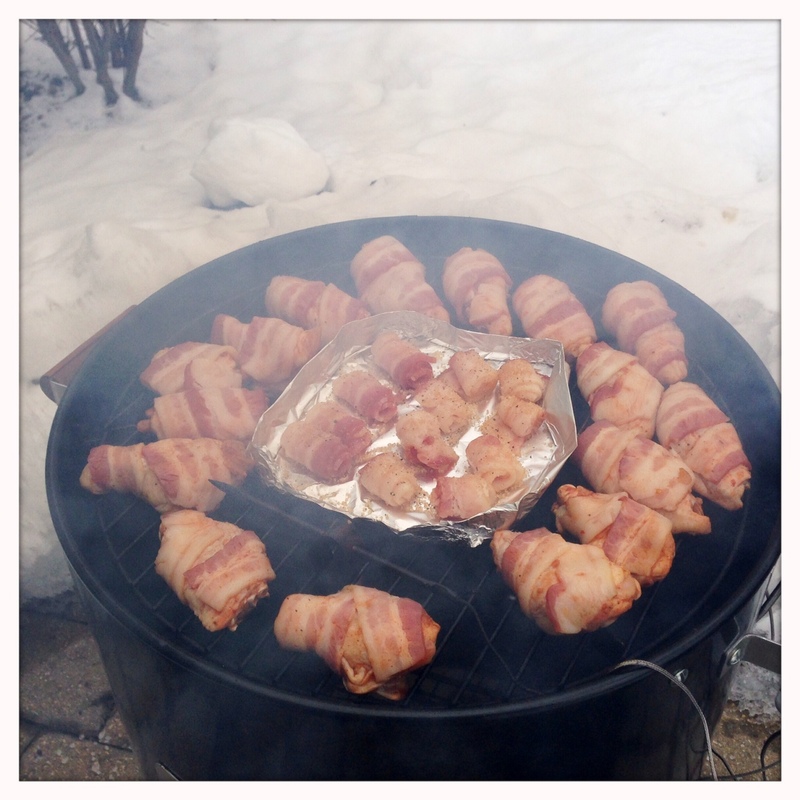 I covered the smoker and let everything cook (without peeking!) at 275 for about 75-90 minutes. 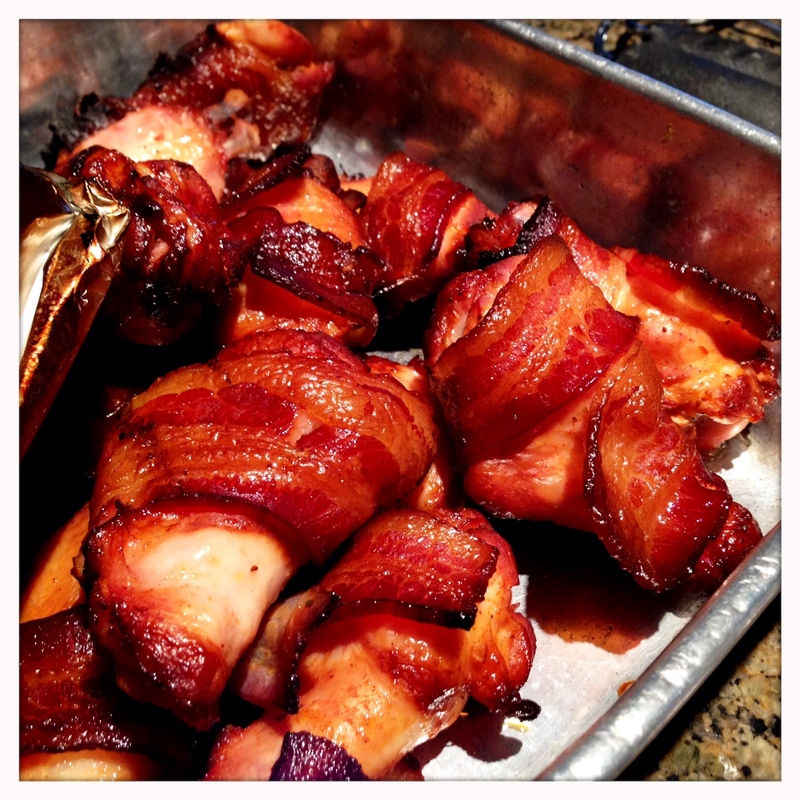 When I pulled everything off, the bacon pieces wrapped around the wings were crisp, but not charred. The real treat ended up being the bacon candy. The sugar melted evenly and created a glaze around the bacon. These appetizers pack a lot of impressive punch for a minimal amount of work and will be the hit of your next social gathering. A little bacon goes a long way, and these treats are both definitely excellent Eats For All Ages. Enjoy!